Child Trafficking: Babies and Their Rescue: Experts Reveal Operational Strategies, Cases. “Give me my baby! Give me my baby! Give me my baby!! !” this was the pathetic cry of a poor young girl who had her four months baby taken from her by allegedly child traffickers. But for the intervention of the men of the Immigration Service who caught the woman from Equitorial Guinea, the alleged traffickers would have made away with the baby. 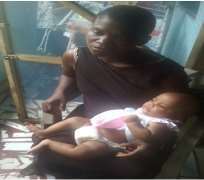 When the child was brought to the office of Commissioner for Women Affairs and Social Development, Imo State, Mrs. Nma Love Onyechere, the baby was taken to a motherless home for the welfare of the child. When investigation was furthered, it was revealed that the mother of the child was a hawker who got impregnated by unknown person and that some women connived with the Equitorial Guinea woman to take the child with the young mother to a destination, where it was discovered that the women pushed the young girl out of the vehicle and took the baby and gave her to the Equitorial Guinea woman, who was later intercepted at Port Harcourt Airport. However, the young girl has long been united with her baby, while the perpetrators have long been charged to court for the unholy act. This, like very many others ranging from another incident that took place where one Alex Ejiogu was arrested for stealing a baby boy, according to the information, the suspect was the owner of a hospital and maternity in Owerri. The Doctor was said to have delivered one Mrs. Eberechukwu Peter of twins baby boys, where the doctor gave one to the mother and sold one to yet to be identified person. Speaking on the past activities of child trafficking/racketeering in Imo State, the Police Public Relations Officer (PPRO), Imo Command, DSP Andrew Enwerem hinted that in the past, child trafficking has been a menace since 2013, adding that in the past nine months, the police under the leadership of Commissioner of Police, Abdumajid Ali, that no incident of child trafficking has been recorded, that it has been completely brought to a halt, adding that all avenue for child trafficking to thrive has been blocked. He posited that the magic of combating child trafficking in Imo is identifying the root cause of trafficking in children and identifying those in the business, adding that the Imo police have used its intelligence in doing that. He hinted that the tempo is sustained by using intelligence to block those channels of trafficking, “so we are hopeful that the crime does not resurface”. He revealed that those caught in child trafficking have been charged to court, stressing that some are waiting trial in the court, while according to him some have been convicted. Speaking earlier to newsmen, the Imo State Commissioner for Women Affairs and Social Development, Mrs. Nma Love Onyechere posited that she would stop at nothing at fighting child trafficking in the state, especially those who operate under the guise of churches. She posited that she would not relent in her resolve to fight the scourge which has eaten deep into the fabric of the society. In his contributions, Mr. Charles Asoluka Ph.D holder in Sociology and a Media Consultant, who gave an insight into the operations of child trafficking in Imo State said that the state is fairly free from both baby factory and child trafficking. He hinted that child trafficking was furthered as a result of the fact that parents who need babies because of their childlessness was on the increase, adding that those who need these babies circumvent the normal process of adopting child/children. Continuing, he posited that some people, sometimes buy babies for rituals, 'juju' and other purposes that offend the sense of decency. He revealed that in the process of trafficking the child, there are some identified as Buyers, who buy the babies in any guise and are sometimes caught by the police. The second people according to him are the Hunters who disguise themselves as Pastors, NGOs among others to traffic children and there is other group called the Horse, who he described as baby thieves who sell to the agents of child trafficking to deliver to whoever sends them. He revealed that sometimes the Conveyers do not know the buyer, stressing that it has been a problem as when the Conveyer is caught, he (conveyer) may not link the police to the buyer because the conveyer do not know the buyer, hinting that the buyer only knows the baby factory owner. Asoluka who is the Author of the book: "Police, Security and National Development- the Abdumajid Ali Factor” revealed that sometimes barren mothers arrange with the baby factory owners, where the mother feigned to be pregnant, asked the baby factory owner to get a young girl, have a man impregnate her and when the girl puts to bed, the barren mother goes out under pretended labour and come back with the child so delivered of by the young girl who gets her payment and goes away. Sometimes, the young girl is not allowed to see her child. “This has brought negative view on child adoption in the state. He hinted that some of the child traffickers may sometimes work with some staff of Ministry of Women Affairs and Social Development, according to him, they work with some Doctors/Midwives who help them deliver of the child. He regretted that sometimes the court delay in convicting the culprits, thereby encouraging other potential offenders. He called on the police, ministry in charge of registering the Homes and the public to continue to monitor what the motherless homes do before and after. It would be recalled that two suspects gruesomely murdered one Madukalu Okechukwu for recognizing them while they forcefully snatched the two children from their mothers at their residence in Ahiazu, Mbaise Local Government Area of the state. It would be recalled further that about 18 pregnant young women housed by a certain woman, popularly called Madam One Thousand for purposes of bearing children and selling them to willing bidders. Madam One Thousand operates an illegal orphanage home in Umuaka, Njaba LGA, where the pregnant women, mostly young and teenage girls are kept for the child-bearing objectives. It was also learnt that Madam One Thousand operates a pure water factory called Ahatee, at the same Umuaka premises where newly-born babies sell between N800, 000 and N450, 000 depending on bargaining power of the customers for different sexes. While the male sales for N800, 000, the female goes for N450, 000 as the child bearing women get N50, 000 as fee for their services. Investigation revealed that last year, one Njoku Franklin, who was aged 18 from Ngor Okpala was arrested for the murder of one Gloria Eze, a four year old girl from Avuru in Aboh Mbaise. The suspect was said to be have lured the victim into the bush and subsequently killed her and hanged the lifeless body on a palm tree. In October, 2013, one Kelechi Eberendu, Innocent Ogbonna and Onwunna Chukwu kidnapped three years old master Nze Iyere who hails from Ikot Ekpene at gunpoint and sold him to one Dr. Francis Onyekwuru who bought him for #250,000 and later sold to Mrs. Ngozi Chukwu (Nurse) who was described as the woman in charge of distributing babies to couples in need of children. In the year 2013, when child trafficking started in Imo State, precisely in October, the Imo State Police Command arrested a suspected child trafficker, Mrs. Rose Azubuike Nwadinobi from Umuda Umuahia North LGA, Abia State with six pregnant girls and three weeks baby boy, master John Paul sold for #900,000 to one Mrs. Akpuchukwu Uzoamaka. Mrs. Nwadinobi was a herbal doctor who gave women hormone-altering medicine to enable them get pregnant and give birth. She settles the girls with #250,000 in place of the child, be it boy or girl, having being impregnated by the suspect's boy friend. In line with all these, the Women Affairs Commissioner, Lady Nma Onyechere has vowed to fight the scourge to standstill, adding that the state has raised a campaign against baby factory/child trafficking, illegal adoption and fostering of children. She noted that trading of babies is punishable by law, stressing that every child deserves to live. She posited that before any child is adopted, the ministry must be aware. Continuing, the Commissioner revealed that the state shall look and has looked into the 36 registered motherless Homes with a view to determining those involved in the illegal act. She said that all the registered Homes have been revoked and that they shall go through a new process of registration, which is on going to know the authentic ones. She warned the staff of the ministry to desist from aiding illegal adoption/fostering, adding that any staff found in that act will be dismissed from office. She was her assertion when she spoke to journalists at NUJ Press Center, Owerri. However, with the concerted effort of both the Police, the Ministry of Women Affairs and Social Development and the general public to bring the hydra-headed monster called - Child Trafficking/Racketeering to a halt, a call has gone to all and sundry to continue to keep alert towards ensuring that the society is permanently rid of the menace. The ministry should mount surveillance on the activities of the motherless homes to prevent/ensure they do not veer off from the intention of the homes. Disclaimer: "The views/contents expressed in this article are the sole responsibility of Chigozie Uzosike and do not necessarily reflect those of The Nigerian Voice. The Nigerian Voice will not be responsible or liable for any inaccurate or incorrect statements contained in this article."